During the 1850s, the immigrant trade to Milwaukee grew like the yeast in the new kinds of beer German immigrants brewed in the city. By now, steamships had generally replaced sailing vessels on the Great Lakes and the steam-driven ships reduced the ocean voyage from six weeks to two. The families of John Kerler and Casper Kuener of Memmingen, Germany, and the Franks from Dietlingen, Germany, were interconnected by friendship, marriage, and the common experience of sailing across the Atlantic. The Kerlers and Kueners came to Milwaukee and the Kueners moved to Sheboygan, Wisconsin in 1849. They paid their own passages and suffered the usual problems of the long voyage. Mathilde Kuener, who later married Edward Kerler, described the Kuener's trip as taking 52 days. She said that although the weather was nice, her family suffered from sea sickness, especially her brother George who had to take several different pills a day. She described him as walking with his head down with his hands stiffly stuck in his coat pockets. Eventually Vernoica’s father John Kerler Sr. bought a 200 acre farm in Greenfield, about 2 1/2 horse hours west from Milwaukee, "between two roads, one of them covered with planks." His daughters, Veronica and Regina, and his sons helped him farm. Veronica had a difficult time adjusting to the new country at first, but in June of 1852, she married August Frank, who had also immigrated to Milwaukee from Germany. He opened a mercantile store in Milwaukee and he and Veronica and their children lived there until her death in 1864. Two of August Frank's sisters, Sophie and Christiane, married men who settled on pioneer farms in Michigan. Sophie Frank married William Seyffardt on June 26, 1852 at Saginaw, Michigan and Christiane Frank married Edward Barck on December 6, 1843. They immigrated to Saginaw, Michigan, and their daughter, Bertha, visited August and Veronica Frank in 1858 and 1859. Henry Frank, Augusts’ brother who had married Veronica's sister, Regina, and lived on the Greenfield farm, described the lake steamer trip to take Bertha home to Saginaw. Henry, August and Ernst Frank made the trip with Bertha to Grand Haven, Michigan. They boarded the steamer at Milwaukee at 8 o'clock on Wednesday evening of May 25, 1859 and went to their pleasant cabins with colorful carpets and padded velvet chairs and sofas. They took Bertha to her cabin, and then found a hidden place where they drank three bottles of ale in a Germany club before they went to bed. They had been told that if they didn't hide their boots, an attendant would pick them by and polish them at a cost of ten cents per person. Henry reported that Ernst and August hid theirs in the luggage, but he kept his boots on and lay down clothed. Henry took the right precautions. As he told it, "At night, when we were sound asleep, a man came and found Augusts’ and Ernest's boots, which they had to pick up in the morning after paying 10 cts, but I went free. This gave us much cause for considerable laughter." At four o'clock in the morning they arrived in Grand Haven and took the train to Flint. From Flint, they took a wagon to Saginaw. The travelers got into East Saginaw at 6:30 and stopped at the hotel. Bertha called "There is Uncle Seyffardt!" and they were met by their relatives. They crossed the Saginaw River and traveled to the original Frank farm. Henry described a joyful family reunion. "We all stayed up until three o'clock the first night and could not get enough of talking." One of the women that Ernest Frank met during the visit was Emma Scheuermann who had been close to his parents back in Germany. By the end of the visit Ernst had fallen in love with Emma, and on June 7, 1859, they became engaged. On the way back from the Saginaw visit, August recorded a humorous incident that happened on the steamer from Grand Haven. Henry sat down at the piano and played a slow waltz. One of the steamer officials came to him and said to him in German, since Henry would not speak English unless he had to, "Please wait until later, there are some folks (sprich vox) sleeping yet." Henry went to Ernst and August and said, "What does he want? He said a fox is sleeping there!" In August of 1859 Ernst wrote to his parents in Germany, telling them about his wedding plans. He planned to live in Milwaukee and he rented rooms for him and Emma not far from August for $5 a month. The wedding was to take place on October 13, 1859 in Saginaw. He planned to leave the Monday before the wedding, which would take place on Thursday morning. In the afternoon the bridal couple would travel to their new home in Milwaukee. Ernst left Milwaukee on Monday evening, October 17, 1859 at 8 o'clock on the steamer Milwaukee. The Milwaukee was a side wheel lake steamer which at been built in 1859 for the Detroit and Milwaukee Railroad Company. It ran between Milwaukee and Grand Haven, Michigan, until it wrecked outside Grand Haven in October 1868. This night in 1859, a violent storm came up about 10 o'clock and lasted until the next morning. 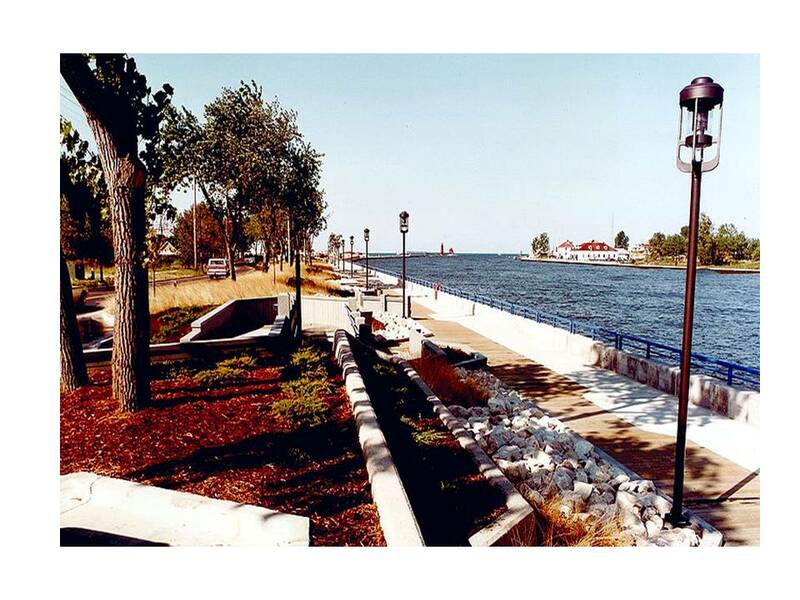 The captain didn't dare try to make the unfinished harbor in Grand Haven because of the big waves, so the steamer had to go back and forth until daylight and the captain thought it was safe to land. When Ernst finally landed in Grand haven at 8 o'clock, he was seasick and heartsick, because he had missed the train for Saginaw. He finally got a stage for Flint and the next evening was traveling toward East Saginaw. After a coach accident, he arrived in East Saginaw where another stage was ready to take him to Saginaw City across the river. This was Wednesday evening, and Ernst was already a day late. He was another hour late because of a stage accident. When he finally arrived, Emma couldn't believe it. She had almost given him up. The young couple was married the next afternoon at five o'clock. They had to cut the happy wedding party short to cross the river to East Saginaw and meet the stage the next morning at 6 o'clock. The newlyweds stayed at the hotel there and left for the trip to Milwaukee the next morning. They arrived in Milwaukee at 3 in the afternoon and had supper in their new home. Emma Frank wrote to her parents-in-law, Pastor and Mrs. Frank in Dietlingen, Germany, from Milwaukee on November 7, 1859. She summed up the final chapter of her emigration from Germany to Michigan to Milwaukee. "The wedding in Saginaw finally went off smoothly after all the guests were gathered together. Ernst had promised to come on the Tuesday before the wedding...but this could not be done because he was delayed a full day by a storm on the lake, and for that reason got to Saginaw on Wednesday...The wedding finally began at 5 in the afternoon and closed with a nice evening meal, which was sweetened by a few nice toasts..."